Because of EU Regulation on nutrition and health – we are very limited on any nutrition or health claims on this product. This does not mean you can’t research your own information on the internet on this product. 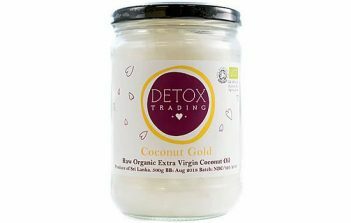 Having tried many different brands of Coconut Oil, we believe our Coconut Oil is the best tasting oil available. It’s delicious, hugely versatile and can be enjoyed in smoothies, raw food cooking, as an alternative to butter, cooking / baking oils, as a tropical spread or added to healthy breakfasts. Made from the flesh of a coconut, our Coconut Oil is raw, organic, virgin, old-pressed, free from preservatives, additives or colouring. It is suitable for vegetarians, vegans and those following a raw food diet. Coconut oil has many health benefits and uses. It is widely enjoyed as an alternative skin and hair care beauty product, as well as for dental care. Coconut oil’s amazing versatility can be attributed to the presence of lauric acid, ketones, capric acid and caprylic acid. As a result of the various health benefits of coconut oil, though its exact mechanism of action was unknown, it has been extensively used in Ayurveda, the traditional Indian medicinal system. Coconut oil acts as an effective hypoallergenic beauty product on all skin types and ages including dry or flaky skin. It is gentle and soft, has a lovely sweet fragrance and can be applied directly on to the skin from the jar. Coconut oil is very effective against a variety of infections due to its anti-fungal, antiviral, and antibacterial properties. According to the Coconut Research Centre, coconut oil kills viruses that cause influenza, measles, hepatitis, herpes, SARS, etc. It also kills bacteria that cause ulcers, throat infections, urinary tract infections, pneumonia, and gonorrhoea, etc. Coconut oil is also effective on fungi and yeast that cause candida, ringworm, athlete’s foot, thrush, diaper rash, etc. It is also free from any GMO.